This is Steve as a 7 ft. Winged Demon of his own making. The huge wings open and close and the "skull" is actually made of the hipbone of a cow... with a jawbone he molded and added for effect. Steve used glowing red lights for eyes. I would like to enter my costume in the "homemade" costume catagory. 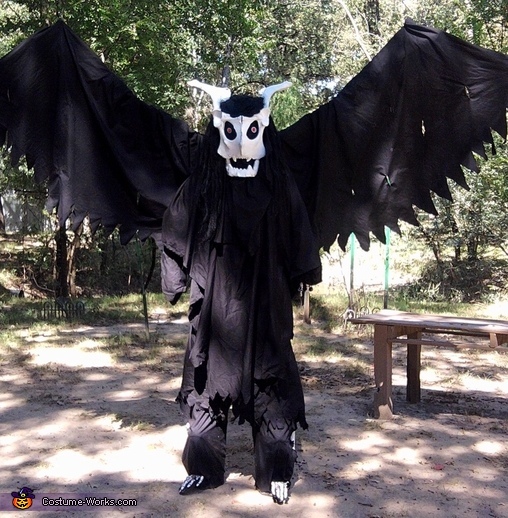 It is a 7ft tall, winged demon with opening/closing wings! The skullpiece is a hipbone from a real cow! The neighborhood dog dragged it from a nearby pasture one day and I made it into a costume. I put red, glowing lights in the eyes in the head also and molded the jaws from rubber molds i made using play-do. All in all I think it's pretty scary at night in the woods!